Is Malia Obama Lesbian ? Malia Obama, a student, and the daughter the 44th U.S. President Barack Obama and former First Lady Michelle Obama. She was named the 30 most influential Teens in 2015. Malia is currently linked to a former British public schoolboy. The couple was spotted several times together. Malia Ann Obama was born on July 4, 1998. She was born at University of Chicago Medical Center in Chicago, Illinois, U.S. She holds American nationality and belongs to African-American ethnicity. She is the elder daughter of Barack Obama, the 44th President of the U.S., and Michelle Obama, a former First Lady of the U.S.
Malia Obama has a sister named Sasha (Natasha) Obama. Her mother is also a lawyer and was a vice-president at the University of Chicago Hospital. In 2005, the family moved to a $1.6 million house in Kenwood, Chicago from their condominium in Hyde Park, Chicago. 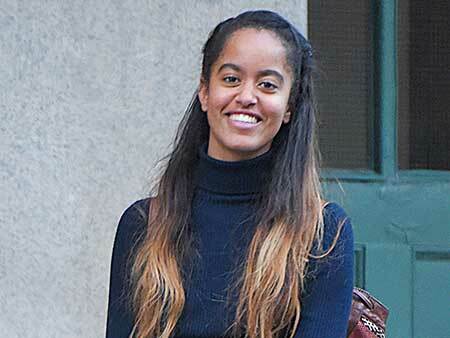 Malia Obama along with her sister, Sasha studied at the private University of Chicago Laboratory School. The Obama family moved to Washington in 2009. There she attended the private Sidwell Friends School, Washington D.C. She joined the classes with her sister on January 5, 2009. She graduated from the school in 2016. Malia broke out from the White House to begin an internship with HBO’s Girls in early 2015. She was photographed while filming Girls on the set. The Obama family adopted a six-month-old Portuguese Water Dog on April 12, 2009. The dog gifted by Senator Ted Kennedy. Obama sisters named the dog Bo, and Bo was referred to as the First Dog by the White House. Barack Obama became the president of the U.S. when Malia was 11 years old. The family adopted a second Portuguese Water dog named Sunny in 2013. President Obama promised to get a puppy to his daughters to take with them to the White House in his victory speech on the night of his election. Malia Obama was named the 30 most influential Teens in 2015. She has become a full-fledged cultural icon; whose fashion choices and college visits make daily headlines. Malia worked at TV studios in New York and Los Angeles in early 2014. She interned in the U.S. Embassy in Madrid, Spain in the summer of 2016. Malia along with her family went to Liberia for the promotion of Let Girls Learn Peace initiative for which the U.S. has donated $27 million in aid for expansion. She went on an 83-day trip to Bolivia and Peru in late 2016. Malia Obama began an internship for Harvey Weinstein at The Weinstein Company (film studio) in New York City. She joined Harvard University in August 2017. She planned to utilize a gap year before attending the Ivy League institution. She is interested in a Hollywood career once she leaves Harvard. Malia Obama stands the height of 1.8 meters. Her net worth is $100 thousand, according to celebrity net worth. She owns a car, which she received on her 16th birthday. His father, Barack Obama had the net worth of $40 million. His annual salary during his presidency in the U.S. was $400,000 (2016). His current net worth is $12.2 million. Malia currently resides in their house in Kalorama, Washington, D.C. worth $8.1 million at present. The house is located 2 miles away from the White House. The Obama family bought the house in 2017. Malia Obama currently resides in Kalorama, Washington D.C. with her family. The family recently rented the house. She is a huge fan of soccer and knows tennis and piano as well. Malia Obama was rumored to be dating Rory Farquharson after being spotted together many times. The rumors of their relationship came to light after she was reportedly filmed kissing a former British public schoolboy during a Harvard-Yale football match in November 2018. Rory was a head boy at a £35,000-a-year private rugby school in England. Malia has also been spotted enjoying a weekend in New York City with her rumored boyfriend in January 2018. As per the source by vanity fair, Rory has left his social-media presence, as he has left Instagram.